Introduction: Many of us take levodopa/carbidopa for substantial symptomatic relief; however, this dopamine replacement treatment only relieves symptoms without offering either neuroprotection or neuro-restoration. We are still anxiously waiting for the study to be released that announces “We describe a new Parkinson’s compound and we’ve nicknamed it hopeful, helpful, and protective“. Today’s post will review an interesting paper from Yuning Che and associates in Dalian, China recently published in Cell Death and Disease (open access, click here to download paper). The ‘hopeful’ neuroprotective compound is the amino sulfonic compound taurine. Before we get lost in all of the possibilities, let’s discuss the science and see what they describe, ok? First, we begin with some background. Neuroinflammation and Oxidative Stress are Pathological Processes that Promote the Development of Parkinson’s: Parkinson’s is a neurodegenerative disorder where we lose dopamine-producing neurons in the mid-brain substantia nigra. There are several pathological patterns known to contribute to the development of Parkinson’s as highlighted below. Related to this post is the negative-effect contributed by long-term neuroinflammation and oxidative stress. Macrophages in the Brain are Called Microglia Cells: In many instances, the body initiates and uses the pro-inflammatory machinery as a host-defense response; in other words, we use it to protect ourselves. When it gets highjacked and becomes detrimental to the host, we realize the sheer firepower of our inflammatory system. The good-and-the-bad of inflammation is mediated primarily by the cells named neutrophils (along with the eosinophils and basophils), monocytes and macrophages. The monocyte leaves the bloodstream and migrates to various organs/tissues where it can ‘mature’ into a macrophage, which is a ‘field commander’ type-of-cell. Think of a macrophage as a General in the bunker of a battlefield, not only giving detailed marching orders but they are also leading the charging brigade of soldiers. Macrophages in the brain are named microglia cells. First, macrophages (microglia cells) are ‘phagocytic’ cells that are capable of engulfing foreign-damaged-invading substances/cells (phagocyte comes from the Greek phagein, “to eat” or “devour”, and “-cyte”, the suffix in biology denoting “cell”). Second, macrophages (microglia cells) direct the inflammatory response by releasing all kinds of substances that give other inflammatory/immune cells their instructions. Sometimes these cells and their instructions become bad to the neighboring tissue/organs; in our case, the dopamine-producing neurons in the midbrain. Microglia-mediated neuroinflammation(Figure credit): Various substances initiate contact with resting unstimulated microglia cells. This ‘activates’ the microglia cell into a cell of considerable fire-power by producing and releasing many substances [nitric oxide (NO), reactive oxygen species (ROS), and several inflammatory cytokines (e.g., IL-1, IL-6, and TNF-alpha)]. This collection of pro-inflammatory substances secreted by the activated microglia cells creates a hostile microenvironment that promotes neuronal cell dysfunction and potential death to the cell. 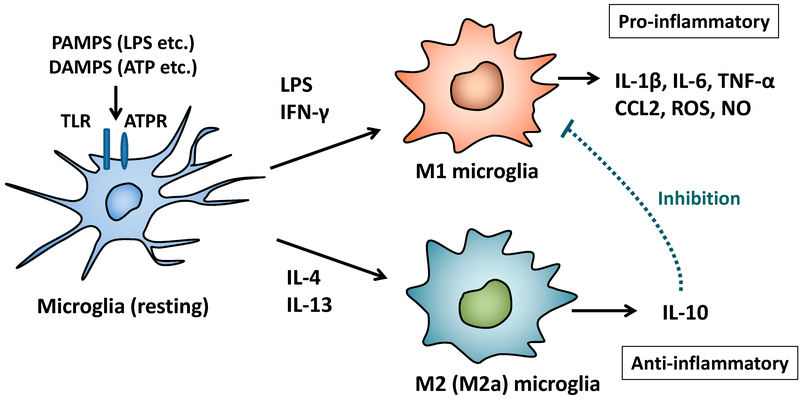 Depending on the need and response of the ‘environmental challenge’, macrophages (microglia cells) can be activated to become either ‘M1’ (focused on becoming a pro-inflammatory) microglia cell or ‘M2’ (transforms into an anti-inflammatory) microglia cell [see Figure below, credit]. In the setting of an invasion or infiltration by microbes, you would want the microglia cell to be activated to a M1 state’ they could attack, engulf and kill the invading microorganism. In this setting, the M1 microglia cell would be protective of you. By contrast, the role of M2 microglia cells would be to turn-off the resultant pro-inflammatory response. This implies that long-term inflammatory events that promote inappropriate M1 microglia cell activation could lead to dysfunction and even cell/tissue death. This description of appropriate/inappropriate microglia cell activation illustrates the complex nature of these inflammatory cells. What this says is in Parkinson’s, chronic activation to M1 microglia cells could generate a detrimental neuroinflammatory environment able to attack host cells/tissues. Taurine: Taurine is an amino sulfonic compound (many erroneously use the term amino acid) and it is considered to be a conditionally essential nutrient. We do not use taurine in the assembly of proteins from genes; however, it participates in several physiological systems. Taurine is apparently a popular additive/supplement in many different energy drinks. Both WebMD (click here) and the Mayo Clinic (click here) have posted overviews of taurine and consider it mostly safe. The structure of taurine is shown below (credit). Taurine is found in the brain, heart, muscle and in many other organs. Good sources of dietary taurine are animal and fish proteins. An interesting overview for using taurine to stay healthy and to promote longevity has recently been posted (click here). Taurine has many proposed physiological functions that range from neurotransmitter to cell anti-oxidant, from anti-inflammatory to enhancing sports performance. The ‘problem’ with having a multi-talented substance like taurine is actually studying these diverse functions individually and trying to test them in rigorous scientific studies, which leads us (finally!) to the paper introduced at the beginning. It is becoming more evident that neuroinflammation and oxidative stress are likely key participants in the development of Parkinson’s. Surrounding the substantia nigra are a lot of unactivated microglia cells, which when activated to become M1 microglia cells they secrete several cytotoxic compounds that can easily harm or kill dopaminergic-producing neurons. In particular, these neurons are susceptible to ‘injury’ due to their low antioxidant potential, low levels of calcium, increased amounts of iron, and the oxidation-susceptible dopamine. Taurine has been shown in several reports to be a neuromodulating substance, boosting intracellular levels of calcium, anti-oxidant, and anti-inflammatory. A recent report linked motor severity in Parkinson’s to low levels of taurine in blood plasma. The authors tested a hypothesis that the supplementation with exogenous taurine might be neuroprotective in a Parkinson’s model sy\stem. Previous studies have revealed a neuroprotective role for taurine in both glutamate-induced and hypoxic-ischemic brain models. They used a mouse model of Parkinson’s caused by injection with paraquat and maneb [(P + M) a two-pesticide model of Parkinson’s], which showed progressive dopaminergic neurodegeneration, gait abnormality, and α-synuclein aggregation. Taurine treatment protected the mouse from the detrimental effect of P + Mu. Their results revealed three effects of taurine in the P + M model of Parkinson’s (i) inhibition of microglia cell activation; (ii) reduced M1 microglia cell polarization; and (iii) reduced activation of cellular NOX2 and nuclear factor-kappa B (NF-κB). Overview of Some of Their Results: Figure 1 presents the effect of P + M to promote a pathological state that resembles Parkinson’s. Panels 1A and 1B show the loss of dopaminergic neurons by the staining of the brain with an antibody to tyrosine hydroxylase (a major dopaminergic neuron protein) following P + M injection. Panels !C and 1D show that P + M treatment lead to the expression of the toxic oligomeric α-synuclein. Not shown here, but P + M treatment resulted in displayed abnormal gaits (Figure 2 in the paper). What do these results show? (1) In an interesting model of Parkinson’s, taurine showed a potent benefit to the mice; (2) taurine reduced loss of dopamine-producing neurons in P + M mice; (3) taurine reduced oligomeric α-synuclein in P + M mice; (4) taurine treatment reduced neuroinflammation by suppressing M1 microglia cells to suggest a neuroprotective effect; and finally, (5) taurine reduced expression of both NOX2 and NF-kB, important genes for microglia cell activation. A similar neuroprotective effect was also found for taurine in an experimental model of Alzheimer’s disease, which resulted in improved cognitive ability. The Parkinson’s model clearly suggests that disease progression by P + M treatment is promoted by chronic neuroinflammation and M1-type microglia cells. Under the test conditions used, taurine was shown to convincingly reduce dopamine-producing neuronal cell degeneration in the presence of the pesticides P + M.
What do these results suggest? There is still much to learn about taurine. There is much potential to taurine being neuroprotective. However, there have been other seriously–convincing-positive mouse model results with other compounds that failed miserably in human clinical trials. The data shown here uses an interesting mouse model of Parkinson’s with a simple yet elegant and solid set of data (that does not appear to be overly interpreted). Taurine has been shown to be safe in treating other human maladies (diabetes and cardiovascular disease). The results here are hopeful that taurine could provide neuroprotection in human Parkinson’s. Hopefully, clinical trials will be started somewhere soon to determine the ability of taurine to provide neuroprotection in human Parkinson’s disease.